From the moment Beyoncé hit the white carpet on Sunday night, the MTV VMAs looked to be profoundly different than usual. Last year around this time, Nicki Minaj was taking MTV and all of pop music to task for its consistent erasure of black women. After “Anaconda” wasn’t nominated for Video of the Year, Minaj acknowledged the perceived slight, tweeting, among other things: “I’m not always confident. Just tired. Black women influence pop culture so much but are rarely rewarded for it.” The circus that followed—public friction between Minaj, Taylor Swift and (somehow) Miley Cyrus, triggered by a mixture of celebrity ego and the omnipresent forces of white privilege—only highlighted Minaj’s point about how black women’s voices are perpetually moved off center. Last night’s VMAs tried a different narrative. Perhaps it’s the narrative MTV meant to sell us, given that the 2015 VMAs featured only one black female presenter (Empire actress Seraya), while this year black women made up seven of some 25 presenters, which included Alicia Keys (and her poem), Serena Williams, Naomi Campbell, Mary J. Blige and Tracee Ellis Ross. But you have to think it was the force of the artists themselves. 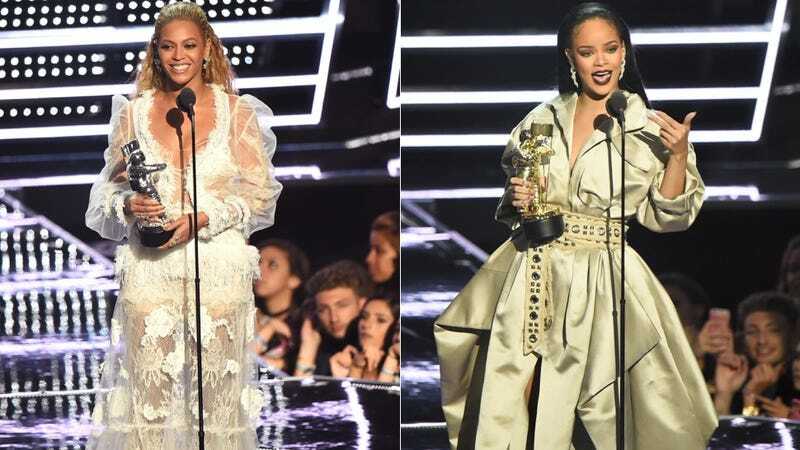 The black female dominance last night was a rare case of visibility for an awards show, evidenced not only by Beyoncé and Rihanna—who released two of the best and most interesting albums of the year and thus made it impossible for MTV to ignore them in the first place—but in Drake’s fawning presentation of Rihanna’s Video Vanguard Award, and in Teyana Taylor’s godly dance moves in Kanye West’s “Fade” video, which he premiered on stage only after an extraneous moment of self-praise. It was evident even in the way Chance the Rapper freaked out over Beyoncé backstage, as one does. That Beyoncé showed up on the VMAs carpet earlier than expected, flanked by Blue Ivy, the Mothers of the Movement and her Lemonade guest stars, was probably kismet. Such a strong visual statement would’ve been enough to make the VMAs a standout from the whiteness MTV typically parades. But then halfway through the show, Beyoncé delivered a medley of songs from Lemonade and it seemed like she might just strong-arm the entire production and perform the album entire. No one on Earth would’ve minded. We have to consider it a television milestone that Rihanna’s most visually stimulating set, out of her many incredible set pieces, was the one that placed her at the center of a gyrating dancehall circle. This might’ve been the most black women MTV has ever had on its VMAs stage, and definitely the largest amount of wining black bodies they’ve seen. The show was a crowning moment for sure—on top of all this, Beyoncé surpassed Madonna for the most VMAs ever. But what happened afterward is proof that the celebration tends to come with a caveat. People, Refinery 29, Cosmo (which tweeted an article titled “This Is Why the Girl in Kanye West’s New Music Video Looks So Familiar”) and Entertainment Weekly were among the outlets that published posts wondering about Teyana Taylor, a singer, songwriter and dancer who perhaps isn’t the most recognizable face but who is well known among black circles and has been signed to Kanye’s G.O.O.D. Music label for years. While her body and dance moves were widely celebrated and gawked at online, she was still perceived as just some anonymous girl. The point wasn’t so much that everyone in the world should know her—these celebrity explainers frequently pollute the internet—but that even at a show where black women were centered, there will be a reality check.